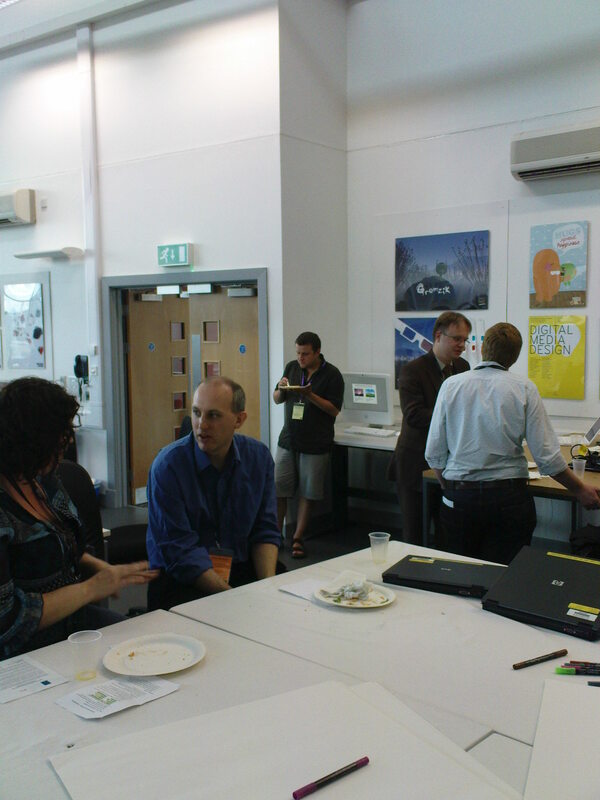 This Mon and Tuesday I was up at the University of Huddersfield at the 2nd Mashed Libraries unconference. Monday evening was all about networking and meeting a fair number of the delegates who like me had come the night before, and was a splendid affair complete with a tour of the city centre ending at the state of Eric Morcombe* by the station. I just wish I’d decided not to walk the 3 and a bit miles into town and the same at the end of the evening! 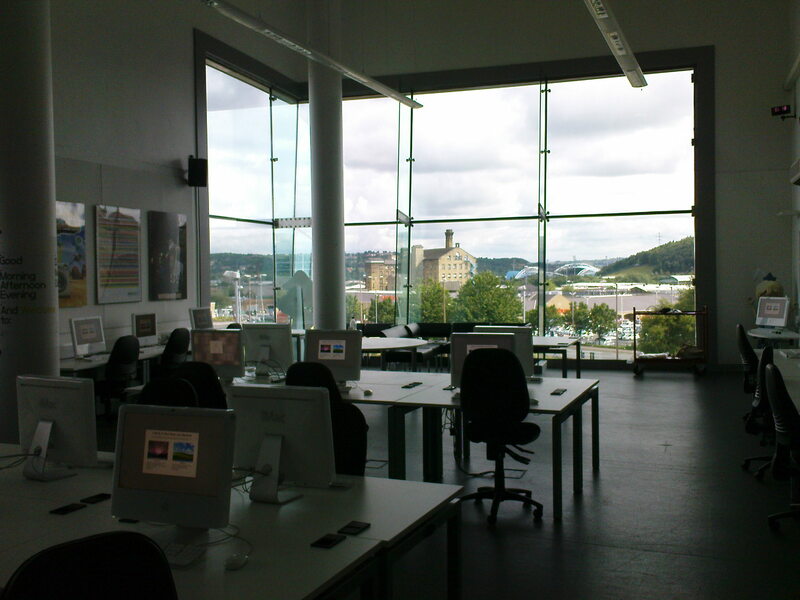 The main event was held in the uni’s relatively new Creative Arts building, which is a very impressive space. Despite some early wifi problems everything went fairly smoothly. Delegates were badged according to their perceived experience with mashups. Greens were n00bs (like me), yellows had some experience, oranges were experts and blue were local staff helping to facilitate. We also had our areas of interest on the badges so you could see at a glance whom might share your areas of enquiry. The day was made up of parallel sessions, breakouts, lightning talks and collaboration; so there’s no way one person could experience the whole event. The first session I went to was by Brian Kelly entitled Enthusiastic Amateurs and overcoming institutional inertia. Mash ups are exciting Brian said says demonstrating some simple ones such as Thumbalizr (thumbnail shots of series of web pages on one screen), then Google Custom search, GoogleMap geolocating unis in the UK. He then showed off some of Tony Hirst’s mashups which demonstrated and tracked down press releases; and how often these were being reused into the blogosphere. In this way freely available data could be analysed to provide useful information. He moved on to talk about barriers, taking a straw poll from those in the hall about their IT services. Most saw them as a barrier to innovation; though not everyone shared this view. It did appear that the smaller, more agile universities were more willing to allow overt experimentation. For everyone else an audience member suggested that you should seek to experiment in alignment with stated institutional business goals, which should help you to get more support centrally. Another suggestion was to experiment in your own time and space, and then introduce senior staff once a more polished object was ready to demonstrate; akin to how we’ve developed this blog. Brian enthused that greater openness to your data is a good thing, as other developers could build services and resources on top of your data, meaning you don ‘t need to do the development. He also stressed the importance of documenting what you do via blogs and the like to show others how to approach the same things. Next I went to a session by Brendan Dawes (www.brendandawes.con) entitled Somewhere I Have Never Travelled. He noted that a lot of the web is based on print paradigm, which isn’t great for everything. His site is a playground for him – a way to represent data in a way that interests him – with no set goal. While there were some wonderful graphical interfaces and perhaps very exciting way of presenting data I imagine most of our users would be terrified rather than enlightened if we started using them. On the other hand selling them to people would seriously have the wow factor. 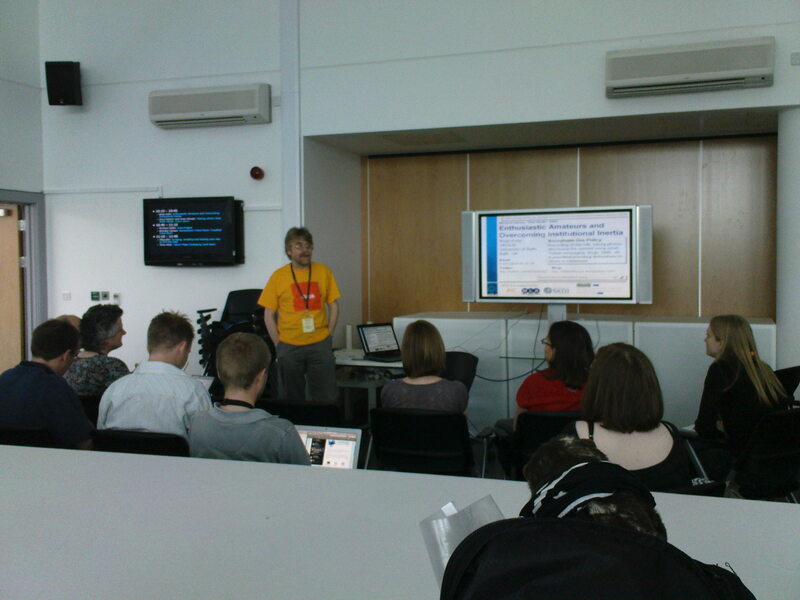 The next session I was in with Mike Elis was about using APIs without knowing technical details. Unfortunately this session licked along at such a rate that rather than exploring a lot of the technical or practical details this turned into a long list of resources you could use. While some were familiar names (like YahooPips) others (Dapper.net, YQL) were very unfamiliar. Rather than listing them here, I’d suggest you go to the Mashed site and have a look at the slides yourself. Before lunch we broke into small discussion groups. We were supposed to be moving between these a bit during the session, though this didn’t really seem to work (I got trapped in a corner). I was in a group talking about overcoming institutional and other barriers to innovation, which was quite interesting – though one group member (not I) did slightly dominate discussions. Following an excellent lunch the rest of the day was given over to various lighting talks on aspects of mashed technologies that might be of interest, as well as elements and applications of Web 2 that delegates might be interested in. This had a much less formal feel to it, and whilst the organisers expected only small audiences for the talks most of the participants stayed in the room to listen. Bit of a shame as it was during this time that there was the best opportunity for hands on collaboration, but few people took up the option. Overall this was an intensive, but very interesting day. I came away if not with more hands on experience of technologies, but a greater understanding of some of the activities that are going on in the library world today. The next mashed event will be towards the end of the year, entitled Middle Mash. *Yes I know it’s Harold Wilson, but frankly the post he’s in is more Eric and Ernie than politician. I’m heading up to Huddersfield this afternoon for the gathering that is Mashed Libraries Oop North. We’ve a pre-event meeting tonight, but the main event is tomorrow – so if you’re interested keep an eye on the tweets that will coming out of this event. Or the blog site for the event. Not 100% sure quite what I’ll get out of the day (I’m keeping a very open mind on this one) – I’m sure it’ll be intensive, hard work but fun. Full report on my return.